What turns a potted plant into a container garden? Some folks consider a combination of plants in a container to be a designed container garden. Others feel container gardens are groupings of containers. It's a fine distinction and as with all things related to garden design, the final decision is up to you. What can you grow in a container? Just about any plant that you can grow in the ground. You can use one season annuals or long-lived trees. It's also a great place to play with plants that aren't hardy in your area, since you can always move them indoors at the end of the season. Then there's the choice of pots. Container gardening may well be the biggest venue for your gardening creativity. Here are some ideas to get you started. Container gardens have evolved beyond a pot of petunias, but they don't have to be exotic to be effective. 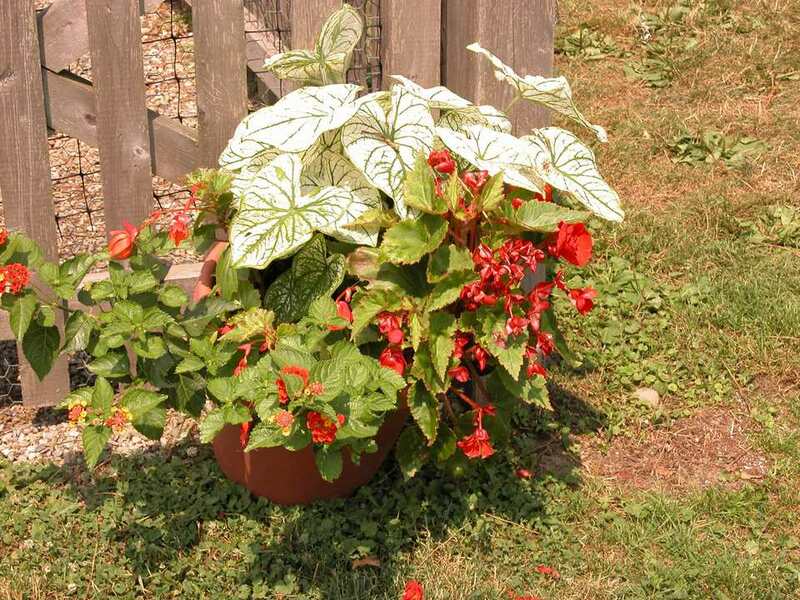 Here a pot of Caladium, Begonia and Lantana makes a welcoming entrance focal point. This large pot of coleus and alternanthera provides a focal point in the flower border, effectively echoing and highlighting the colors of the surrounding plants. This small container garden at Beds & Borders Nursery demonstrates how the principles of good garden design can be incorporated into containers. The height is in scale with the size of the pot. There's variation of texture and form with large and small leaves and coarse and fine textures. And the lime green of the tall arrowhead draws the eye up from the lime green echoed in the licorice plant. Here's another great example of using garden design principles to create a container garden. Notice how the trailing gray-green Dichondra almost mimics the nearby lattice work. There's variety of form and texture. And the magenta flowers echo the color of the wonderful tall millet, anchoring the container. Sometimes you need something to soften hard edges or too much of a good thing, like all this wonderful stone work. The soft, flowing colors and textures of this small pastel container garden blend with the gray of the stone, while softening and warming the effect. As with the previous small pastel container garden, this garden box is used to balance and soften the wide expanse of decking. The box itself mimics the decking boards, but the draping foliage, soft in both color and texture, offsets the harshness of deck. It also serves as a living screen, transforming the deck into a garden room. A large container requires larger than life plants, to be in balance. Too many small, fussy plants would ruin the effect. Here, the oversized foliage is balanced with a more serrated texture leaf below, anchored by a softening fine textured trailing plant, drapping over the pots edge. There's no denying this cluster of containers is a garden focal point. Sure, the statue is eye catching. But pairing the statue with the flower containers turns unused space on the driveway into a whimsical minigarden. Sometimes it's the container itself that makes the container garden. Cement and hypertoufa trough gardens are once again popular garden accents. They can add a touch of age and character to the newest gardens. When the container has character, there's no need for extravagant plantings. A delicate pansy brings enough color contrast to draw your eye's attention to the texture and color of the small hypertoufa pot. Part of the charm and fun of container gardening is that anything can be used as your container. Old memories, like this rusting highchair, found objects, even the kitchen sink. Used with discretion, they add personality to your garden. Just be careful your garden doesn't turn into a junk yard. Houseplants are fine, but a collection of succulents, ferns and low light flowers, like begonias, creates an indoor garden in a container. One of the best uses of container gardeners is to grow fruits and vegetables in areas you thought were too small to accommodate. Something as simple as a pot of mixed lettuce plants can be beautiful while feeding more than just the soul. And it doesn't take much space to cluster together a few larger 2 - 10 gallon pots and turn them into a whole vegetable garden. When growing tall vegetables, be sure you provide some type of vertical structure for the plants to climb and make certain the pot will be heavy enough to balance the top growth. You can also go smaller scale, with a tabletop vegetable garden. When creating a tabletop vegetable garden, choose dwarf plants, like this patio tomato, and fill in the container with low growers like chives, lettuce and edible flowers.